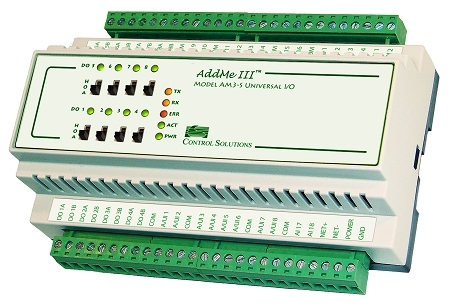 AddMe III Model AM3-SB makes an ideal add-on BACnet MS/TP I/O node, or stand alone freely programmable controller. Its 32 points include 18 analog/universal inputs, 4 analog outputs, 8 relay outputs, and 2 pulse inputs. 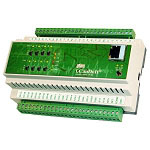 Control Solutions’ AddMe IIIfeatures 18 universal inputs which are context sensitive. When configured as an analog input, the continuously self-calibrating sigma-delta converter produces 15-bit resolution with high noise immunity. When configured as a discrete input, the converter switches to 8-bit resolution at 128 samples per second for fast response. All I/O points are accessed as BACnet objects. - - - 0.3A @ 24VDC max.